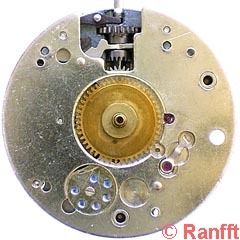 The movement has 14 or 15 functional jewels - quite many for a pin-lever movement. 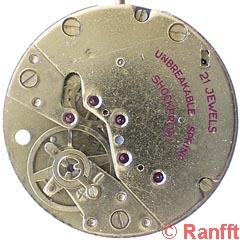 If the impulse pin is made of steel instead jewel, there is such jewel between the bearings of 3rd and 4th wheel, to achieve at least 15 jewels (Fig.1). Further 2 or 6 jewels to achieve 17 or 21 jewels sit in a tiny round plate, particularly made for this purpose (Fig.2 bottom left).